Launched in June of this year, MSC Meraviglia will kick off its inaugural season in North America by making a maiden call to New York on 7OCT, 2019 and offering three sailings departing from the Big Apple. MSC Meraviglia will sail two 10-night round trip itineraries from New York, as well as a third 13-night itinerary through the Caribbean, ending in Miami. In addition, prior to arriving in New York, MSC Meraviglia will sail a 17-night transatlantic cruise from Kiel, Germany with ports of call in destinations such as Denmark, the United Kingdom, Iceland and Canada. Translating to “wonder,” the 5,714 (4,488 double occupancy) passenger ship MSC Meraviglia offers a variety of unique features. 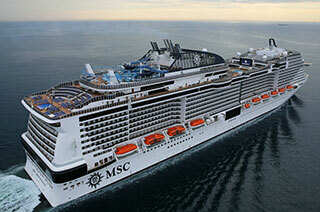 ·An enhanced MSC Yacht Club, which has become MSC Cruises’ signature luxury offering. In addition, the ship caters to families with modular connected staterooms that can accommodate up to 10 people, multiple LEGO-designed play areas for all ages, and a polar themed aqua park, featuring four water slides. “Bringing MSC Meraviglia to New York is the perfect introduction for the ship to the U.S., providing travellers an option to check out new itineraries with MSC Cruises and, for those in the region, a convenient way to discover MSC Meraviglia style, sophistication and stellar on board features,” said Roberto Fusaro, President of MSC Cruises USA. Guests can officially book sailings for MSC Meraviglia’s inaugural season in North America beginning 2JAN, 2018. · 18OCT, 2019: The second 10-night sailing for MSC Meraviglia departing from New York will explore Canada as well as the New England region, with ports of call in Bar Harbor, Maine; Saint John, New Brunswick; Halifax, Nova Scotia; Sydney, Nova Scotia; Portland, Maine; and Boston, Massachusetts. · 28OCT, 2019: MSC Meraviglia’s final sailing from New York will journey to Miami through the Caribbean on a 13-night sailing. Guests can experience picturesque Caribbean destinations like Philipsburg, St. Maarten; Fort de France, Martinique; Bridgetown, Barbados; Saint George, Grenada; Willemstad, Curaçao; and Oranjestad, Aruba, before arriving in Miami. Upon departing New York, MSC Meraviglia will homeport in Miami, sailing alongside MSC Seaside and MSC Divina. MSC Meraviglia will offer a full season of 7-night cruises, departing on Sundays and sailing to two itineraries in the western Caribbean. The first itinerary will include Jamaica, Cayman Islands, Mexico and the Bahamas, and the second will stop in Mexico, Honduras, Belize and the Bahamas.